This is popularly known as payathamparuppu payasam. This is offered to LORD OPPILIAPPAN on a Sravanam (Tiruvonam) day, when we dont eat salt in any form. Pressure cook moong dhal and mash well. Boil milk till it reduces to half. Dissolve jaggery in little water, strain the dust and allow it to boil till it diffuses its raw smell. Now add in the mashed dhal and milk. Bring it to a boil. Season it with fried cashews, powdered cardamom and pachaikarpooram. Offer it to the LORD. delicious and tasty payasam to offer to god as a neivedhiyam Shanthi.By the way uppiliyapan tan engga kula deivam. Looks very nice..will try for friday pooja !! u reminded of my Mom made Moong Dal kheer... yummy! My fave payasa with Holige/Poli. Looks yum. That bowl of payasam is very tempting and delicious!!! Tasty....my mom adds bits of coconut & little coconut milk. Delicious.. 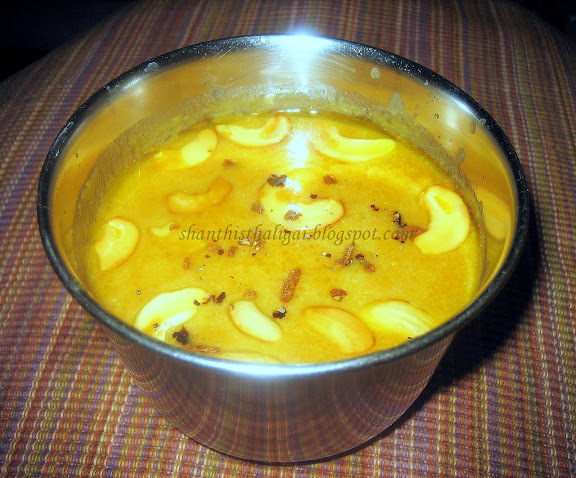 I do make this payasam but in a bit different way..your picture itself is so nice..
My fav payasam. Looks delicious. Hi Shanthi !! Well this is looking so Yummy !! I always love trying different types of Dal and i would love to try this one also but after my wedding.Nice post ! !Will be back. 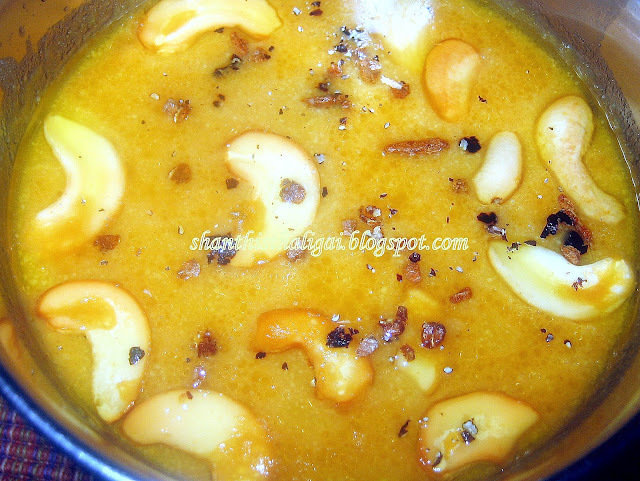 Looks wonderful Maami - I haven't made this in a while - you are inspiring me to make it soon. pacha payiru paayaassam looks rich, appetizing and delicious!!! I love payasam and halwa made from moong dal. Its delicious as well as nutritious. Thanks for sharing. Payasam looks beautiful ! Would surely try this. Looks so inviting... I love it . Payasam looks tempting and delicious. Always wanted to make this payasam that u Shanti Kumar looks soo tempting !